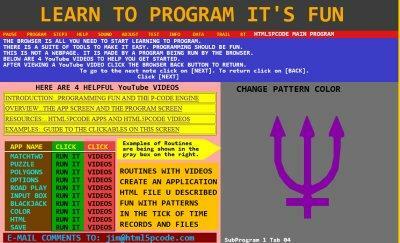 This p-code lends itself to teaching coding because the source and object code are the same. The engine that created the code (source-code) is the same engine that executes the code (object-code). This makes it possible to do the following options. A DATA OPTION allows you to view the game's data, while the game is running. A TRAIL OPTION allows you to execute a few instructions at a time, so you can see what each routine is doing. A REAL TIME (RT) OPTION allows you to change instruction values, while the game is running. The YouTube videos show how these options are used in the designing of the game.